It’s been a while, hasn’t it? This time I bring you answers from the secretary of The Golden Notes, Kyra Fitzgerald! 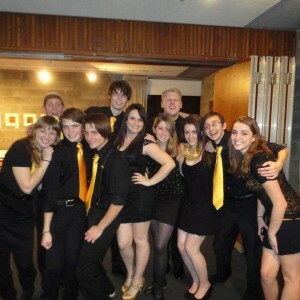 A: The Golden Notes is a group that rehearses with the aim to entertain and inspire audiences on campus and off. A: Vocal Director: Jenny Gorman (Senior), Business Manager: Steven Musso (Senior), Secretary: Kyra Fitzgerald (Senior), Public Relations: Abbey Naumowicz (Junior), Choreographers: Tess Leavay and Stephanie Lacker (Seniors). A: This semester we and 15 members, but we have lost some members and are looking for a few faces to enhance the group! Q: When do you hold auditions? When and where are your regular meetings? A: We hold auditions at the beginning of every semester, depending on our needs. Our meetings are Monday evenings from 8-10 PM and Thursday evenings from 7:30-9:30 PM in Massry. Q: Are there any students that you’d especially recommend try out? A: Anyone is welcome, no matter the major! 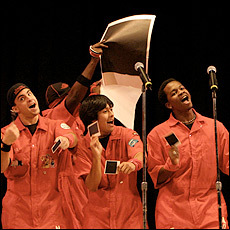 If they love a cappella and performance, we encourage them to audition! A: We do work with other clubs rather regularly! We have often collaborated and arranged performances with the Girls Next Door and The Other Guys, as well as performing for the Dance Club’s Spring showcase and at other clubs’ events on campus. Q: What events have you held or participated in before? What were some of your favorites? A: Something new we did this semester was to hold a Cabaret night where we served dinner and performed solos and group numbers from Broadway and off-Broadway musicals, and we even learned a dance for our opening number! It was a lot of fun! And we always look forward to performing at Relay For Life because it is such an emotional and spiritual evening and it helps the group grow closer as we share our music and experiences with others. A: Next semester we will be travelling to share our music with some high schools in state, as well as travel out of state for the ICCA’s (International Championships of A Cappella)! But don’t worry, we’ll be doing plenty of on-campus gigs too! Q: Do members get any special opportunities through this club? Any club clothing? A: Being a part of the Golden Notes allows for new friendships to form, but also new experiences.We have gone to concerts and performed at other colleges and venues because of this group, and we will soon be travelling to Boston to compete against other a cappella groups and learn from their strengths and, hopefully, make some new friends. Q: Are there any dues that must be payed in being a part of the club? A: There are no dues, unless of course we go out for group dinners or road trips! Q: Is there anything else you would like to add to those who might try out? A: Rehearse! If the music is available ahead of time, do your best to learn it before the audition! If you show us you will be committed, we will notice!! A: For more information on The Golden Notes, feel free to contact any of the officers, most notably our Business Manager, Steven Musso. My fellow blogger and music major, Genevieve, also made her own personal post on The Golden Notes here. ← The Saint Rose Difference!